When it comes to his ‘idea’ that one way to begin fixing current immigration problems is to re-define ‘birthright citizenship’; Republican Presidential candidate Donald Trump proves, once again, he has absolutely no idea what he is talking about. Donald Trump said Tuesday that he doesn’t think people born in the U.S. to undocumented immigrants are American citizens. “I don’t think they have American citizenship and if you speak to some very, very good lawyers — and I know some will disagree — but many of them agree with me and you’re going to find they do not have American citizenship. Donald Trump: Birthright babies not citizens. I am guessing that one of those “very, very good lawyers” he refers to, is Ann Coulter, who hypes the same drivel in her book Adios, America and, at least when it comes to Trump’s forays into immigration ‘policy,’ is an unabashed fan. First, a little background. “I have turned against her [Carly Fiorina) as of yesterday with the hot, hot hate of a 1000 suns. …yesterday among the attacks I saw on the magnificent Donald Trump immigration plan was, you know, everybody wants to get rid of anchor babies. You can read the section of my book. It’s very short. It’s not from the 14th Amendment. And I would bet Mr. Trump paid dearly for Ms. Coulter’s advice. But neither knows what he or she is talking about. Rather, the 14th Amendment, implicitly assuming the fact that slaves, whether natural born or naturalized, were citizens of the U.S., merely re-stated that fact. For effect, it also clarified that, by definition being a citizen of the U.S. also means, being a citizen of the state in which one resides. (Prior to the 14th Amendment, some states and the District of Columbia denied the status of ‘citizenship’ to slaves.) But the sole purpose of mentioning the citizenship status of natural born and naturalized people was to serve as a preamble to the heart of the Amendment: all citizens of the U.S. (and therefore, the states and D.C.) are entitled to equal protection and due process. In so doing, the 14th Amendment now extended the Due Process entitlement already found in the 5th Amendment, which had applied to the federal government; to the states and D.C. https://www.law.cornell.edu/constitution/amendmentxiv Thus, inasmuch as Congress defines all people born in the U.S. as citizens under the law; then, any newly initiated program, whether Executive or Legislative in origin, which calls for the involuntary deportation of these citizens requires due process. This means, even if the ‘plan’ floated by Mr. Trump was implemented, the Judicial branch would be inundated with and drowned to a halt by the petitions of citizens facing such deportation. So much for taking ‘legal’ advice on immigration, from someone with a vested financial interest in selling her books. The title of this post is inspired by a line in the last stanza from one of my favorite poems, Reluctance, by my favorite poet, Robert Frost. I have always found giving up without a fight to be treasonous, especially when I am certain I am right. And I am certainly right about Barack Obama. That is, people within the DNC selected him to become POTUS notwithstanding the evidence indicates he is Constitutionally ineligible for the job. Specifically, he is not a NBC. Indefatigable, I have assembled this primer which, hopefully, will end the interminable farce over how best to address his Constitutional eligibility. I name the names of those people responsible for depositing him in the Oval Office, and define the precise scope of their culpability, in anticipation that efforts to rectify this election anomaly will now be focused squarely on them. Keep in mind that, by identifying the people with direct culpability, I am by definition ruling out everyone else. For starters, this blameless faction includes Barack Obama. Because even assuming he is not a NBC, without these others, he could never have gotten the job. When Americans vote for a President and Vice President, they actually vote for presidential electors, known collectively as the electoral college. It is these electors, chosen by the people, who elect the chief executive. The Constitution assigns each state a number of electors equal to the combined total of its Senate and House of Representatives delegations; at present, the number of electors per state ranges from three to 55, for a total of 538. Anyone may serve as an elector, except for Members of Congress, and persons holding offices of “Trust or Profit” under the Constitution. In each presidential election year, a group (ticket or slate) of candidates for elector is nominated by political parties and other groups in each state, usually at a state party convention, or by the party state committee. It is these elector-candidates, rather than the presidential and vice presidential nominees, for whom the people vote in the election held on Tuesday after the first Monday in November (jbjd note: date omitted). In most states, voters cast a single vote for the slate of electors pledged to the party presidential and vice presidential candidates of their choice. The slate winning the most popular votes is elected; this is known as the winner-take-all, or general ticket, system. Maine and Nebraska use the district system, under which two electors are chosen on a statewide, at-large basis, and one is elected in each congressional district. Electors assemble in their respective states on Monday after the second Wednesday in December (jbjd note: date omitted). They are pledged and expected, but not required, to vote for the candidates they represent. (jbjd note (08.05.10): Some states have enacted laws that require Electors to support the nominee of the party; but no faithless Elector has ever been prosecuted for violating this oath, and Congress has never failed to ratify the vote of the Electors even when this includes the votes of these faithless Electors.) Separate ballots are cast for President and Vice President, after which the electoral college ceases to exist for another four years. The electoral vote results are counted and declared at a joint session of Congress, held on January 6 of the year succeeding the election. (jbjd note: Congress enacted a law changing this date to January 8 just for the year 2009.) A majority of electoral votes (currently 270 of 538) is required to win. This report will be updated as events warrant. Immediately after this Congressional Ratification, self-identified “Patriots,” certain BO is not a NBC, flooded the blogosphere with hyperbolic rants against everyone in Congress for failing to insist on a Constitutional vetting of the man before voting for Ratification. These so-called ‘Patriots’ referred to Congresspeople of both parties as “Traitors,” accusing their elected officials of committing “Treason” for failing to uphold the eligibility requirements for POTUS spelled out in the Constitution, even though, ironically, the Constitution itself required Ratification once Congress was confident the Electoral College had conducted its vote in accordance with the ‘process’ prescribed by the Constitution. In other words, Congress is not directly responsible for making BO POTUS but only for Ratifying the results of the voting undertaken by the Electoral College. This means that they are also not responsible for the fact he is Constitutionally ineligible for the job, even assuming he is Constitutionally ineligible for the job. This does not mean the Electoral College is directly responsible for making BO POTUS. Neither the Constitution nor federal law prescribe the manner in which each state appoints its Electors other than directing that they be appointed on the Tuesday after the first Monday in November. In most States, the Electors are appointed through a state-wide popular election (“general election”). That is, voters only elect Electors in the state’s general election. Currently, Electors are nominated to fill these positions by the political parties at their state party conventions or by a vote of the party’s central committee in each state. Electors are often selected to recognize their service and dedication to the party. Generally, they hold a leadership position in the party. Often, they are major party fundraisers. They may be state elected officials but, the Constitution prohibits members of Congress from becoming Electors in the Electoral College. Weeks after their ‘appointment’ by means of the general election, these elected state Electors meet in each state – this gathering of Electors is referred to as the Electoral College, although the term Electoral College does not appear in the Constitution – to cast votes for the next POTUS. The Constitution is silent about the factors that go into their voting decision. Thus, Electors are Constitutionally free to cast votes for whomever they want. This means, they may even vote for a person who is not the nominee of their political party or, is not in the same party as the slate of Electors that won the state’s general election. However, some states have enacted laws that require the slate of Electors receiving the largest popular vote in the state’s general election, must cast their votes for the Presidential nominee from the same political party. In other words, in these states, if the D’s received more votes than the R’s, then the Electors for the D party must cast their votes for the D party nominee. And every state except for NE and ME, and the District of Columbia are winner take all, meaning, all of the electoral votes assigned to that state (or the District of Columbia) must be cast by Electors of the winning political party. Immediately after the vote of the Electoral College, self-identified “Patriots,” certain BO was Constitutionally ineligible for the job, flooded the blogosphere with hyperbolic rants against the Democrats in the Electoral Colleges who cast votes for BO without first vetting him for Constitutional qualifications. These ‘Patriots’ referred to Electors representing the Democratic Party as “Traitors,” accusing them of committing “Treason” for failing to uphold the eligibility requirements spelled out in the Constitution. But remember, the Constitution does not require Electors to vet the party candidate for President as to Constitutional eligibility, being silent as to the qualification of the person Electors may elect for the job. In other words, the Electoral College is not directly responsible for making BO POTUS but only for casting their votes for him in accordance with both the Constitution and state law, as the nominee of the D party when that party was the winner of the state’s general election. This also means that they are not responsible for the fact he is Constitutionally ineligible for the job, even assuming he is Constitutionally ineligible for the job. Then, the responsibility for electing an ineligible POTUS must be found in a process directly related to his nomination. is required to win. This report will be updated as events warrant. (CORRECTION: 10.09.10: In this article, I wrote that HI was the only state that required explicit language in the documentation submitted to election officials that the candidate for President from the major political party was Constitutionally eligible for the job, to be entitled to have that person’s name printed on the ballot. But as I explored the election laws of more states, I learned HI was not alone. For example, on 10.02.09, 3 (three) weeks after I posted this article, I posted UP to HERE in ELECTION FRAUD in SC, FROM the CHAIR of the 2008 DNC CONVENTION to the CHAIR of the DNC, pointing to the fact that under SC law, the party also must Certify to election officials the candidate is qualified for the office to get them to print the candidate’s name on the ballot. 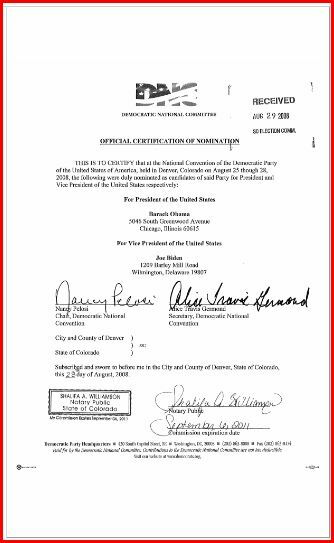 And I posted the image of the Certification the SC Democratic Party submitted to get Obama’s name on the ballot; only, it was that state’s Presidential preference primary ballot. Because in SC, candidates participating in the primary must register through the political party. In this case, the Certification was hand-written by then state party Treasurer, Kathy Hensley. Nancy Pelosi, Speaker of the U.S. House of Representatives and 3rd in line of Presidential succession, told USA Today that drowning out opposing facts is “un-American.” Certainly, if drowning out opposing facts is “un-American” then ignoring facts must be un-American, too. FACT: UNDER THE PROVISIONS OF ARTICLE II SECTION 1 OF THE UNITED STATES CONSTITUTION, THE PRESIDENT OF THE UNITED STATES MUST BE A NATURAL BORN CITIZEN. FACT: SERVING AS CHAIR OF THE 2008 DNC CONVENTION, NANCY PELOSI SIGNED THE DNC’S OFFICIAL CERTIFICATION OF NOMINATION SWEARING 1) BARACK OBAMA IS THE “DULY NOMINATED” CANDIDATE FOR PRESIDENT OF THE DEMOCRATIC PARTY; AND 2) HE IS LEGALLY QUALIFIED TO SERVE UNDER THE PROVISIONS OF THE UNITED STATED CONSTITUTION. Once state elections officials receive the Certification of Nomination, they automatically print the name of the party nominee onto the general election ballot. (Remember, even in states that have passed laws requiring the party candidate for POTUS to satisfy the qualifications for office, no provision of law requires any state official to check. Indeed, when asked, state elections officials confirm, all vetting is left up to the party.) So, on what basis did NP (and the state D party Chairs) Certify to state elections officials in all 50 (fifty) states, BO is a NBC? Given the narrow window of time between the Convention nomination and the deadline for submitting the party’s Certification of Nomination to state elections officials – these deadlines vary state to state – any determination as to BO’s Constitutional eligibility presumably was made some time before his August nomination. So, what could have been the basis for such verification? Explaining he was ‘reacting to questions swirling around as to his Constitutional qualifications,’ BO created the web site “Fight the Smears” in June 2008, less than 3 (three) months before Ms. Pelosi would sign his Certification of Nomination. NOTE: THERE HAVE BEEN SEVERAL ITERATIONS OF THE WEB SITE NAMED “FIGHT THE SMEARS.” SOME OF THESE ARE .ORG’S; SOME ARE .COM’S. BURIED IN THE FOOTER, SOME OF THESE FTS SITES REVEAL THEY ARE “PAID FOR BY BARACK OBAMA”; SOME ARE PAID FOR BY OBAMA FOR AMERICA; SOME SAY THE DNC. But whatever the iteration of FTS, prominently displayed on the site is a photocopy of the document everyone has seen by now, entitled, “Certification of Live Birth” (“COLB”). (Until the fall of 2008, HI officials noted the distinction between a “Certificate” and a “Certification.” See, for example, Atlas Shrugs, linked above.) BO claims the “truth” is, this COLB proves he is a “native citizen”; and in the following note, he asks his supporters to spread this “fact” around. People who are determined to keep us divided start these rumors about Barack’s birth certificate to manipulate us into thinking he is not an American citizen. The fact is Barack Obama was born in the state of Hawaii in 1961, a native citizen of the United States of America. In the following version of FTS, BO actually cites the 14th Amendment to support his nativity. BUT NONE OF THESE ITERATIONS OF “FIGHT THE SMEARS ” ARGUES CANDIDATE BARACK OBAMA IS A NATURAL BORN CITIZEN! Also prominently displayed on all of these FTS sites is the logo for the organization called Annenberg Political FactCheck.org (“APFC”). FTS directs readers to an active link to the APFC site, claiming APFC “clarifies Mr. Obama’s citizenship.” Here is how APFC summarizes this situation. In June, the Obama campaign released a digitally scanned image of his birth certificate to quell speculative charges that he might not be a natural-born citizen. They go on to report that APFC staff personally examined Obama’s COLB before rendering this exact opinion. Our conclusion: Obama was born in the U.S.A. just as he has always said. FACT: CONTACTED BY CONCERNED CONSTITUENTS PRIOR TO RATIFYING THE RESULTS OF THE ELECTORAL COLLEGE VOTE IN FAVOR OF BARACK OBAMA, MEMBERS OF THE U.S. SENATE AND HOUSE OF REPRESENTATIVES INSISTED, ANNENBERG POLITICAL FACT CHECK PROVED HE IS A NATURAL BORN CITIZEN. Thank you for contacting me. I appreciate hearing from you. President-Elect Barack Obama, is not a natural-born American citizen. Again, thank you for taking the time to share your thoughts with me. status as a natural-born citizen, as required for admittance to U.S.
document is real and genuine. you and welcome this opportunity to respond. variety of sources, including…the Annenberg Public Policy Center. sharing your thoughts with me. of the United States. Thank you again for writing. Thank you for getting in touch with me. It’s nice to hear from you. I appreciate knowing of your concern over a rumor that President-elect Obama is ineligible to serve as President because he is not a U.S. citizen. The Fourteenth Amendment to the Constitution states that “all persons born or naturalized in the United States, and subject to the jurisdiction thereof, are citizens of the United States.” Since President-elect Obama was born in Hawaii two years after it was admitted as the 50th state, he is a natural-born citizen. He has released a copy of his birth certificate and it has been authenticated by experts. FACT: ANNENBERG POLITICAL FACT CHECK DOES NOT CHECK FACTS. In response to a comment on a blog, I contacted one of the attorneys involved in a court case seeking to determine whether BO is a NBC. I received a reply asking for help. Here is my response. I am glad you took me up on my offer to help. I haven’t formalized my ideas, so I will just throw these out for now. Pledged Delegates for HRC who switched to BO; or who were pledged to BO in the first place, and voted for him at the DNC Convention, but would not have voted for him had they known, he is not a NBC, would have standing as Plaintiffs in a civil action for (fraud, unjust enrichment…). ESPECIALLY DESIRABLE ARE PLEDGED DELEGATES FROM THOSE STATES THAT HAVE ENACTED LAWS REQUIRING DELEGATES PLEDGED AS THE RESULT OF PRIMARY VOTING MUST FOLLOW THEIR CANDIDATES ONTO THE FLOOR OF THE CONVENTION. (There are around 13 of these ‘binding vote’ states; I have the list.) And some of these vote binding states also have laws about ballot access, that require the candidate for POTUS from the major political party must be eligible for the job. (None of these states requires any government official to check.) Off the top of my head, I know GA is both a vote binding state AND a state requiring the party candidate to be eligible for the job. As for strategy… Months ago, when drafting the Declaratory Judgment case I mentioned above, I reasoned, it made no sense to try to support a claim, BO is not a NBC. Instead, I argued, Plaintiffs had reasonable cause to believe, he might not be a NBC, based in large part on his own words and actions. But since that time, things have changed, especially with regard to these 4 (four) events. 1) Several people have contacted Nancy Pelosi qua Chair of the 2008 DNC Convention to ask on what basis she Certified BO is a NBC. She refused to respond. 2) HI officials have spoken in circles in a botched attempt to ‘confirm’ BO is a NBC. 3) BO, personally (before being sworn in) and through his spokespeople, continue to dodge the issue by lying that the Certification is a Certificate and proves he is a NBC. 4) In Berg’s Hollister case, BO Motion to Dismiss contained a footnote asking the court to take judicial notice that Annenberg Political Fact Check said he’s for real; and that an announcement of his birth had been published in a HI newspaper. (Of course, if the judge had taken judicial notice, we lawyers would have known, this meant nothing; but everyone else would have interpreted this to mean, the court has ruled, he is a NBC. Thank goodness, the court did no such thing. However, this confirmed my suspicions, as spelled out in the earlier draft of the military Complaint, that the strongest ‘evidence’ BO could proffer to establish he is a NBC, is that stupid photocopied on-line Certification; which means nothing!) Taken together, this could form a good faith belief in a reasonable person that no evidence exists that would establish, BO is a NBC. SHIFT THE BURDEN OF PROOF AND PRODUCTION TO HIM! And as for objections to this strategy, argue “unclean hands” (you blocked access to all documentation and now cannot argue, we cannot submit proof); or unjust enrichment (you distributed the COLB to Daily Kos and Annenberg Political Fact Check in order to refute “rumors” about your citizenship status – you said so, on your “Fight the Smears” site – and now, having banked on that COLB, it isn’t fair to raise privilege and confidentiality to block our access to those records that could verify whether your claims are true). Finally, to overcome claims of sovereign immunity, I would drop all claims against conduct that occurred viz a viz the Congressional ratification of the EC vote; rather, go after NP as Chair of the 2008 DNC Convention. Go after any other actors not as failed Congresspeople but as co-conspirators to the fraud.